Fructus Schisandrae is grown mainly in the provinces of Jilin and Liaoning, and in southern China. After it is collected in autumn, the fruit stalks are removed and the fruit is dried in sunlight. The dried fruit is used unprepared or mixed with vinegar or honey, steamed, and then dried in the sunlight for use. Properties & Taste: Sour and warm. Meridians: Lung, kidney and heart. Functions: 1. To astringe the lungs and nourish the kidneys; 2. To promote the production of body fluids and astringe sweat; 3. To restrain the essence and stop diarrhea; 4. To calm the heart and soothe the mind. 1. Chronic cough and asthma due to rebellion of lung qi caused by deficiency of the lungs and kidneys manifested as cough with scanty sputum and asthma aggravated by slight exertion. Schisandra fruit (Wuweizi) is used with Dogwood fruit (Shanzhuyu), Prepared rehmannia root (Shudihuang) and Ophiopogon root (Maidong) in the formula Baxian Changshou Wan. 2. Deficiency of qi and body fluids manifested as spontaneous sweating, night sweating, thirst, palpitations, shortness of breath and deficient and forceless pulse. Schisandra fruit (Wuweizi) is used with Ginseng (Renshen) and Ophiopogon root (Maidong) in the formula Shengmai San. 3. Diabetes manifested as thirst, preference for excessive fluid intake, shortness of breath, lassitude and deficient and forceless pulse. Schisandra fruit (Wuweizi) is used with Astragalus root (Huangqi), Ophiopogon root (Maidong), Fresh rehmannia root (Shengdihuang) and Trichosanthes root (Tianhuafen) in the formula Huangqi Tang. 4. Chronic diarrhea caused by deficiency of the spleen and kidneys. Schisandra fruit (Wuweizi) is used with Nutmeg (Roudoukou) and Evodia fruit (Wuzhuyu) in the formula Sishen Wan. 5. Seminal emissions and nocturnal emissions caused by deficiency of the kidneys. Schisandra fruit (Wuweizi) is used with Dragon's bone (Longgu) and Mantis egg case (Sangpiaoxiao). 6. Deficient yin and blood of the heart and kidneys manifested as palpitations, irritability, insomnia, dreamful sleep and forgetfulness. 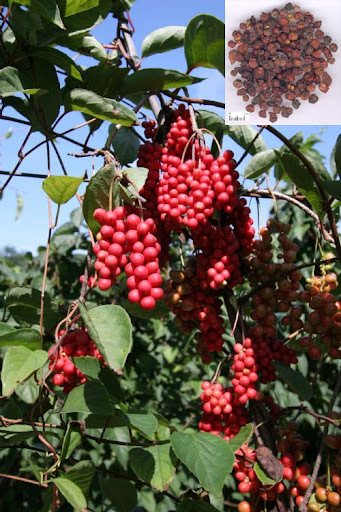 Schisandra fruit (Wuweizi) is used with Ophiopogon root (Maidong), Fresh rehmannia root (Shengdihuang), and Wild jujube seed (Suanzaoren) in the formula Tianwang Buxin Dan. Dosage: 2-6 g, ground into powder for internal use, 1–3 g each time.